I was reading an article by Katy over at Charles and Hudson about the benefits of what’s known as a “Cool Roof”. If you recall from our garage spray foam installation, Fred and I opted for a “Hot Roof” on our new, in-progress workshop. Katy’s article got me thinking about the benefits of both Cool Roofs and Hot Roofs over Traditional Roofs, and which option is actually the better choice. Traditional Roofs (employing asphalt shingles, vented attics, and insulation on the floor of the attic) can get extremely hot, with surface roofing temperatures reaching up to 190° F during the summer. This can easily create attic temperatures as high as 125° F. The hotter an attic is, the more expensive it is to cool the upstairs of a home. The excessive heat collected by buildings using Traditional Roofs contributes to the Heat Island Effect, a phenomenon where heavily-developed areas (like cities) can be up to 22° F hotter than nearby rural areas. The effect on summertime peak energy demand, air conditioning costs, air pollution, and greenhouse gas emissions is huge. So what can we do about it? Well, “Cool Roofs” and “Hot Roofs” present two options for tackling the heat problems inherent in a Traditional Roof. What’s so Cool About a Cool Roof? Cool Roofs keep radiant heat and solar heat out of your home using a reflective coating on the surface of the roof. Cool Roofs are broken into two categories: low slope and steep slope. Each requires different materials for construction. Each Cool Roof application has different reflectance properties (yes, that’s a real word), so you’ll need to read up before making a selection. Here’s a great guide to learn more about Cool Roofs. By reflecting radiant and solar heat, a Cool Roof stays up to 60°F cooler than conventional roofs during peak summer weather. The Cool Roof Rating Council claims the “average energy savings range from 7%-15% of total cooling costs.” The EPA references a publication by S. Konopacki, et. al. 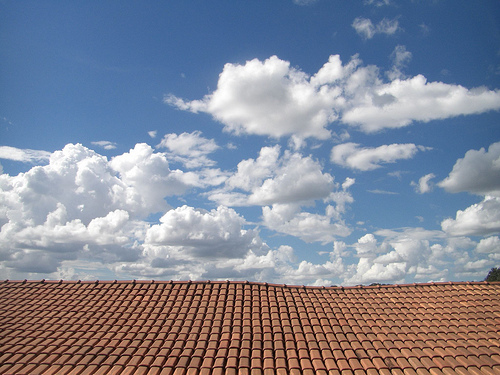 stating that Cool Roofs provide an average yearly net savings of almost 50¢ per square foot in California. That includes the costs for Cool Roofing products and the increased heating costs in the winter due to lack of solar heat penetration, which is desirable in the winter. What’s so Hot About Hot Roofs? Fred an I chose a Hot Roof application (video and review) to insulate the new workshop, meaning the attic is completely sealed and unvented. Air does not flow in or out, and the attic is included in the conditioned space. We achieved this by having 3″ closed-cell spray foam installed directly to the roof sheathing. The term Hot Roof is a bit misleading, as the shingles only get a few degrees hotter than a regularly vented roof. Think about the electric, plumbing and HVAC that runs through many attics. With a Hot Roof, you’re not digging through insulation to find wires and junction boxes, pipes won’t freeze and burst, and the air flowing through ductwork will stay the right temperature. Additionally, conditioned attics are great for storing stuff, and there’s no concern about extreme temperatures. Hot Roofs act as a thermal break and will prevent ice dams from forming on the roof during winter months. I tapped Sean from Alabama Green Building Solutions to help clear up a few lingering questions I had about Hot Roofs and Cool Roofs. Sean is a great resource and I suggest checking out his article about Hot Roofs on SLS Construction. Would you rather have a hot roof or a cool roof? Which results in better energy efficiency? Depends on the location, shade, and a whole host of other items, but you can’t just have the coating without the insulation & proper air-sealing work being done to truly compare them. If you try saying the coating only is enough, you are in for a world of hurt. I would tip the hot roof generally as being the most efficient. Are different climates better for one or the other? 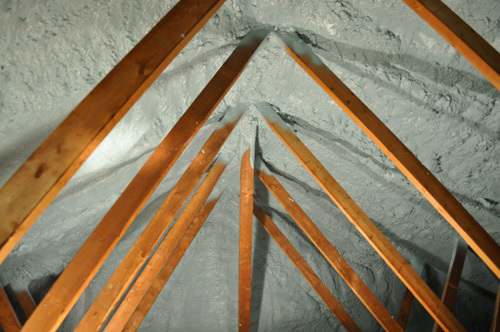 The hotter the climate, the better a cool roof will help out a properly insulated attic. A hot roof will work “great” in any climate. Depends on what you are factoring in – all the insulation, the coating, a roof replacement if needed, air sealing, new or existing… The Hot Roof will usually run more, but it generally doesn’t need any ongoing maintenance. Don’t forget that the foam may also need an ignition barrier, which is added cost. Images courtesy of schuey and NNSANews. I remember watching The Daily Show, when Stephen Chu was a guest, and he mentioned that if everyone did one simple thing, it would reduce our energy consumption by like 1% overall — shingle with light-colored asphalt tiles! The black tiles (as you pointed out) absorb heat, but the lighter colors reflect heat. It was pretty astonishing. A really great article, and incredibly timely! If I had my roof to do over (including the rafters), I’d put shortened rafters on (that end at the wall. Install ice and water barrier over the roof sheeting and tie it into the walls and then 6″ of rigid foam on top of that with vertical strapping followed by another layer of sheeting. The attic would have sufficient R-values, be air sealed, and the roofing would be vented (through the vertical strapping). Alas, I’ll probably just end up spray foaming the current attic (maybe after adding some rigid baffles all the way to the ridge vent) and calling it a day. 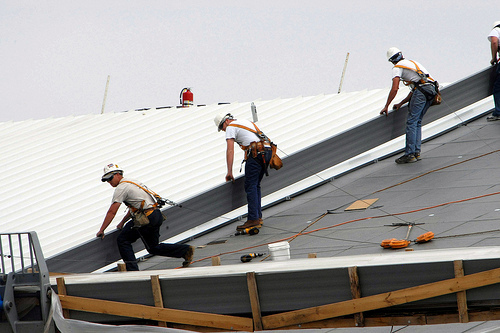 I keep saying that when I replace the roof on my house, its going to be done with standing seam metal roofing. I like the look, and its so much less maintenance, virtually no possibility for ice damming (no horizontal seams, and the snow is going to slide off anyways). Just be sure to have the snow clips installed over door and walkways. Standing seam is a good look for sure. This is really interesting. I’ve never heard of a hot/cold roof. I’m going to file this away for a day when our HOA doesn’t have a say. For example lets say you have a shingle roof, while the HOA does have a say on the color, there generally isn’t an issue on the brands & they do make “ENERGY STAR” shingles in certain colors that can be used. Certain types of metals also qualify, and a concrete or olSpanishsh tile roof almost give one the same effect. Jeff – that also is a great option for those that believe that roofs do need to be vented, if you do go with the 6″ of foam panels, recommendcomend 2 3″ pieces overlapped, or maybe even 3 2″ lifts (taping all seams) – that will help eliminate any air & moisture leaks. The one area to be careful on is with your AHJ, and whether they will allow the foam panels to be exposed like that. This post is extremely appealing. I am with cool roof. Liquid Rubber Coatings Definitely a coating that offers protection from leaks however additionally repairs the roof and saves your electric bills too. .